The Riverside Transit Agency is giving customers another reason to ride the bus with free rides on RapidLink, July 1 to September 3. Just hop on and your ride is free – no coupon or secret code is needed. There’s no schedule – buses depart every 15 minutes. During the morning, RapidLink Gold Line buses depart UC Riverside and the Corona Transit Center from 5:30 a.m. to 8:30 a.m. Afternoon buses depart between 2:30 p.m. and 5:30 p.m. RapidLink Gold Line travel times are up to 30 percent faster than Route 1, which travels along the same Magnolia Avenue and University Avenue corridor. Click here for schedules and stops. The 16 RapidLink buses, which carry up to 38 seated customers and 17 standees, use clean-burning fuel, offer free Wi-Fi and USB charging ports, and include a rack that can carry up to two bikes. Another feature is the ability for riders to track buses in real-time with BusWatch, on the BusWatch app or on the Transit app. Since service began last August, ridership aboard RapidLink has remained steady, with roughly 2,500 riders a week. RTA expects ridership to grow, once customers become more aware of the service. The free RapidLink rides are part of a larger campaign to get people on the bus this summer. In June, RTA kicked off a promotion that lets students in grades 1-12 ride for just 25 cents all summer. 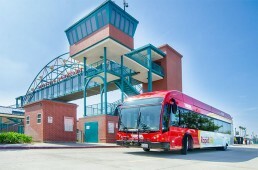 Expanded “Beach Bus” service aboard Route 202 also has begun with express trips every day from Murrieta and Temecula to Oceanside. 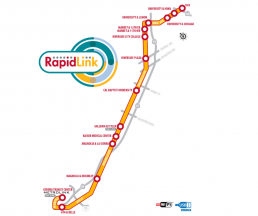 Riding RapidLink after the promotion is $1.50, the same as other RTA local bus routes, and all RTA passes are accepted as well as U-Pass, Go-Pass and City Pass programs.